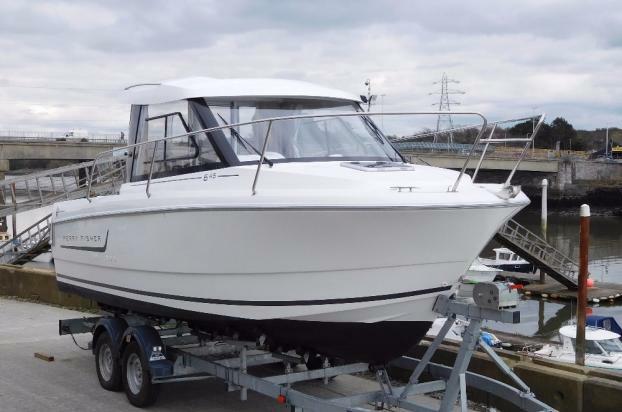 Presented in excellent condition and fitted with a Yamaha 115hp fourstroke outboard with 160 running hours. Garmin touchscreen chart plotter / fishfinder, fridge and full cockpit seating. Complete with twin axel road trailer. The Merry Fisher 645 has a 2 berth cabin with an infill, galley and dinette for 4 adults. The galley is to starboard and is equipped with a sink and drainer plus a gas cooker. Underneath are generous cupboards for stowage. 12 volt fridge. passenger helm seat. The V berth is very large with an infill cushion. Chemical toilet. GRP hull deck and superstructure.